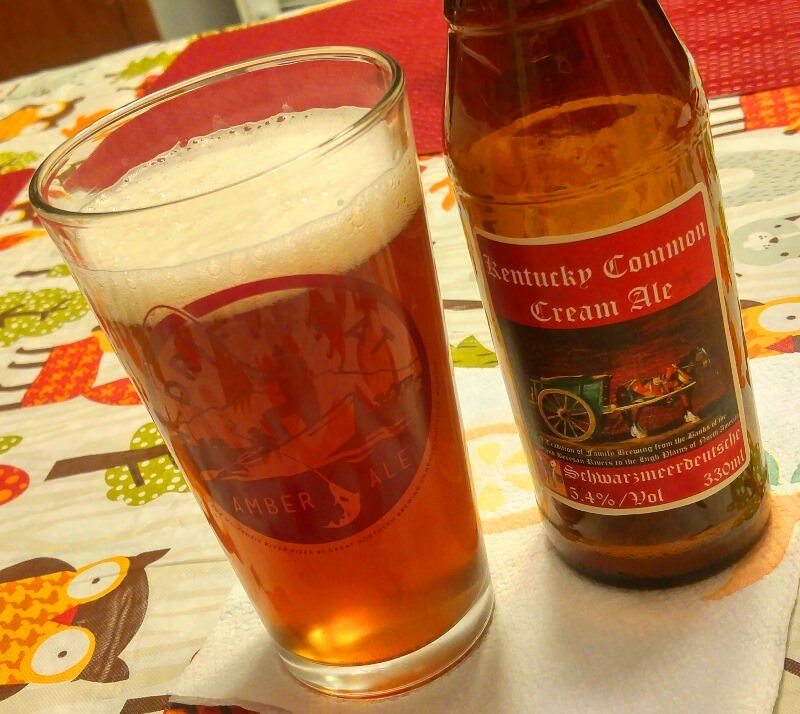 Kentucky Common Ale - The BSB SportzMan - A Forum for OutdoorzMen! NOTE - The recipe in this opening post has undergone various modifications as it has evolved. If you would like to try this recipe, please scroll down to the latest version. Sooner or later, there will be a "final version," which will be noted as such. 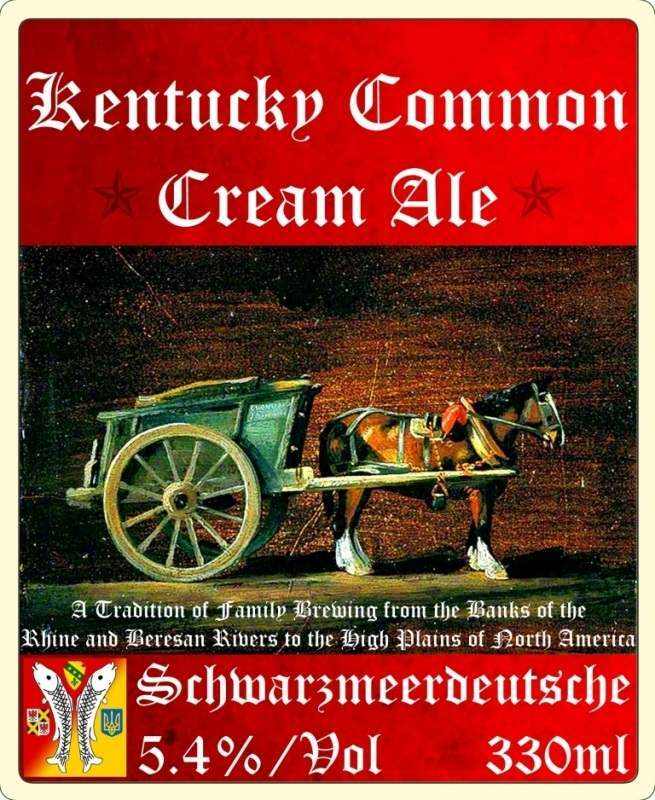 A truly home-grown variety, this beer was intensely popular in Kentucky from the post-Civil-War period until Prohibition. Based on what little there is available (sources below), and extrapolating from the known to the vague, I've developed what I think is a reasonably-plausible adaptation. This 1-gallon adaptation bypasses the corn-grit cereal mash with flaked corn and employs a 60-minute boil, rather than 120 minutes. The caramel malt that I chose was due to its middle-of-the-road quality, while the hops and yeast seem to be the best compromise between what was described and what is available. Cluster hops might not be exactly the right bittering hop, but it seems to be the closest that I can find to "California Gray." I chose Hallertau rather than Saaz as an aroma hop because I believe that the Germans who were doing the brewing would have used this Bavarian variety. Sounds good , I don't drink much beer. One note: After re-reading the source material for this beer, and noting the emphasis on the fact that it is a malt-forward beer, I backed off on the hops just a bit, in order to bring the IBU's down to 24.08. With that, I think I am finished, until I have an opportunity to try the finished product. The brew went off with no significant hitches that I can recall; my #2 son, Mike (known here as MuleTail) gave me a hand, and we had a pretty good time, I think. He's an IPA guy, so he was pretty amused by my modest use of hops, but it's all good. He showed me a couple of things that he does when he's brewing, and they looked like pretty good tips to me, so I will be using them in the future. Mash - I was able to keep the temperatures fairly close to where I wanted them - and it smelled great! The flaked corn added a nice touch, I think. Sparge - No sticking issues, no spills - everything went fine. Boil - I went with the slightly-modified hop schedule (below) for lower IBUs as the maltiness (bordering on sweetness) was mentioned prominently in the research; everything went fine and on schedule. The Cluster hops smelled really good with this, and the Hallertau Mittelfrüh added a nice touch, as well. I was actually tempted to add a little more hops at all stages, but for this first one, I left things alone. Chill-down - once again, no hitches. I have never used Irish moss before, but I definitely plan to use it more often, after this experience; it really pulls the crud down, it seems. Transfer to fermenter and pitching the yeast - no troubles at all; I only had to top off with a very small amount of water - I'd say less than a quarter-cup. The only irregularity of note was that the wort/beer was slightly darker than expected, in spite of the very, very small amount of black malt and C60. Where these dark malts are concerned, it doesn't take much! The darker colour could also have something to do with my water; I've noticed that all my brews, no matter what style and no matter what conditions, are always just a bit darker than I expect them to be. No big deal, as they all taste great. I checked in on my beer this morning, and the S05 is definitely doing it's thing; slow and steady, which matches my experience with it so far. There is a nice cap of krausen developing, and I am sure that by the time I get home from work, it will be churning up for a good, solid fermentation and the blow-off tube will be getting busy. The ambient temperatures are just a few degrees higher than I would prefer, but we still seem to be well within the tolerance of this yeast. The next few days will be cooler, and this will help. Considering that we have been consistently above 90 since the end of June and are finally seeing some relief, I am not going to complain. 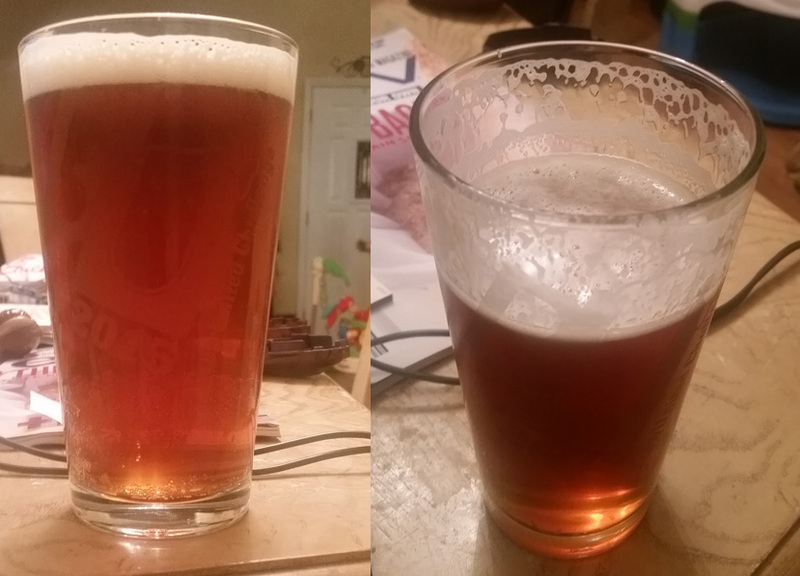 Out of curiosity, I did some Googling and looked at some photos; based on what I found, I think that my colour for this beer (which I originally thought was too dark) might be pretty close, after all. I found a few that were a little lighter, and a few that were a little darker; I also found quite a few that were nearly identical. 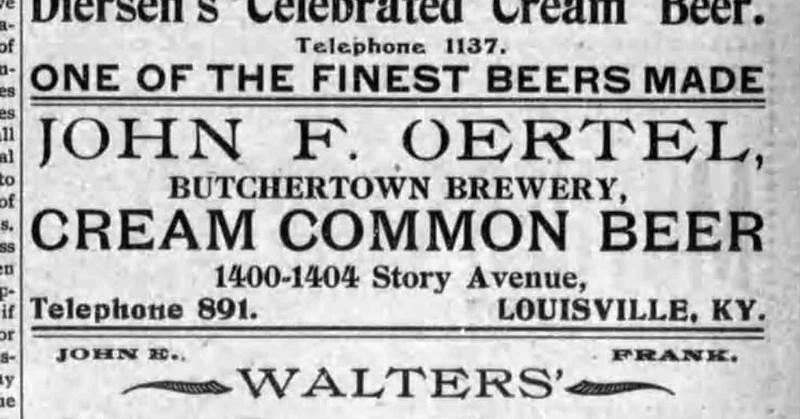 If you look at this and the advertisement above (which is somewhat cut off), it is plain to see that "back in the day," this beer was referred to as a cream ale. I checked on my beer when I got home from work last yesterday; ambient temperatures were still just a hair higher than I would prefer, but were within stated tolerances and moving down to something more reasonable. My experience tells me that 65-ish seems to be just about right, and I am guessing we will be there, soon. Usually, my problem is the opposite, and I am trying to bring temperatures up. Anyway, fermentation still seemed to be starting slowly, but this seems to be the norm, considering the other couple of times that I have used S-05 yeast. Sure enough, when I checked on it this morning, the beer had that churned up, cloudy look that comes with full-blown fermentation, and the blow-off tube was happily blip-blip-blipping away. Tonight or tomorrow, I will replace the blow-off tube with an air-lock, and we will let it ride for a while, until it is time to cold-crash and bottle. If anything comes up in the interim, I will post about it. I checked on my beer again last evening and this morning; I am happy to report that all is well. My ambient temperatures are sitting right at 65 degrees, which is where I want them, and fermentation is in definite full swing. I switched out the blow-off tube for an air-lock, and plan to leave the beer alone to do its thing until it is time to bottle. A lot of the other stuff that can be Googled seems to be pretty worthless, as far as reliable historical research goes. Most of it is either for marketing commercial "revivals" of this beer, or from homebrewers who did not take the time to read the research carefully. For instance, some used rye, even though it was never used, and others employed a sour mash, even though the overwhelming research supports that this was not intended to be a sour mash beer. For these and other reasons, I mostly stuck to the article above, which led directly to the BJCP guidelines that are also cited above. I struggled quite a bit with the "Western" or California Gray" hops mentioned in the article for bittering. I found a couple that are descended from California Gray, but was unsure as to whether they would actually be similar or not. In the end, I simply went with Cluster Hops for bittering, which seem to be the most commonly-used bittering hop by people who recreate this beer; also, Cluster hops are already used for aroma, making it a convenient choice. I chose Hallertau Mittelfrüh as the German aroma hop rather than Saaz because I believe that the Germans who were doing the brewing in Louisville would certainly have known of and used this Bavarian variety. I brewed this last week and it's still fermenting, so I am not (yet) sure how it is going to turn out. It seems to be darker in colour than I expected (possibly because of my water), but smells and looks great, so far. The IBUs might need to be bumped up to around 27; but then again, the research specifically mentioned that the bitterness is low, and the beer is malt-forward and almost sweet. The Irish moss may not really be necessary to the beer or the recipe, especially since it was historically served much "younger" than anyone nowadays would be tasting it, and the beer would probably clear on its own just fine - but still, it certainly can't hurt. I put this beer in the refrigerator to cold-crash on the evening of Monday, 2 October 2017. The next two days, we had a power outage due to a freak snow storm, so I will probably bottle this over the weekend. I am expecting (and hoping for) good things! Quite a "ride" with you to create a home brew from history. Pretty crafty label also....very nice read but an alien subject for me. Hope it turns out well. First mention of "Mule Tail" in a while too. Good to see you guys have a common interest beyond hunting and guns. Hey, IBD - great to hear from you! Yep, Mule Tail and I usually have a good time brewing some beer. We tend to like different types of beers (he prefers the hoppy IPAs, while I enjoy the maltier German, English and American beers), but he knows that when I brew I enjoy some company, so he's almost always on hand to help out, and we have a decent time. I've tried a few of the ones he's done, and have been impressed. I have high hopes for this batch - I should be bottling it tonight - 2 or 3 weeks after that, we'll know how it truned out!! I bottled this beer last night and I'm pretty sure that this beer is going to end up being just about the way that it is supposed to be. It might possibly end up looking a little darker, once it is in the glass, but this is the very close to the colour that I saw in the siphoning tube, and it looks beautiful, to me. I like them because they are versatile (low-to-high carbonation, depending on how many you use), consistent, convenient and fool-proof. For this beer, I chose a "medium" carbonation, which is 4 tablets per bottle. Due to a glitch on my part I was about 3 ounces shy of 9 bottles for this batch, so my #2 son Mike and I split the extra for a sample, leaving 8 bottles that will be carbonated in 2 weeks. The sample was very good, and very tasty, keeping in mind that this is not the finished beer, yet. I was again impressed with the colour of the beer and liked that it was a bit on the darker side; that tiny, tiny bit of black malt worked really well! The aroma was malty and had a unique character that I assume comes from the corn and caramel; I don't remember anything relating to the hop aromas, but I wasn't really thinking about it at the time. My over-all impression is that they blended in well and complimented the profile as a whole, without asserting themselves or becoming dominant. I'll try to report more on that with future tastings. 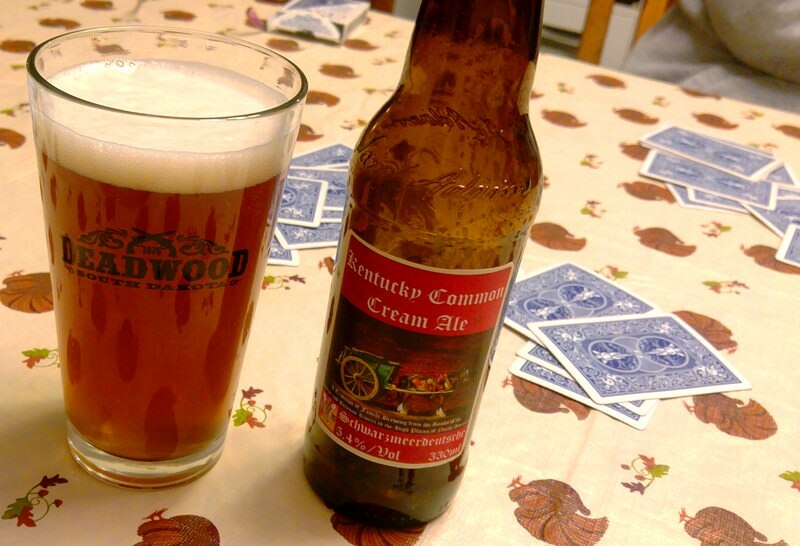 The descriptions that I have read of Kentucky Common Ale include words and phrases such as "mild in character," "malty" and "slightly sweet," and those descriptions certainly seem accurate after trying this. It tasted the way you would expect with 6-row, corn and caramel malt, and had just enough bitterness to keep it from being too sweet. I am rather inexperienced with these types of beers, but over-all, I think I hit pretty darn close to the intended mark with this. So far, it seems like a very drinkable, very tasty beer, and it is funny that Mike and I both looked at each other and said at the same time, "Grandpa (meaning my dad) would love this." Of course, the beer isn't finished yet, as some conditioning still needs to happen; I expect these initial characteristics to change a bit and will report on the results. I was finally able to sample this on Friday, and it was excellent - simply excellent! I am calling this research project and recipe experiment a complete success. Granted, given the available information, it wasn't too difficult, but my primary goal was to stick as closely to the original as I was able to, and I believe I did do that. Appearance: I had jostled the bottles around the night before, putting on labels, so there was just a little bit of haze there. Before putting on the labels, the beer appeared very, very clear in the bottle. The colour was a beautiful amber/copper, just as I was hoping. The head was just a tiny bit off-white and had a very nice texture to it. I couldn't have asked for much better. Aroma: I remember enjoying it very much, but not any specifics. I do remember getting the over-all vibe that it smelled like good, fresh beer, with a nice balance to it. I don't remember anything specific in regards to the aroma of the malts, but the Hallertau Mittelfrüh hops provided a very typical and expected ambience. Taste: I remember that I liked it, very much! It had a good, maltiness to it and had a little something extra that was really nice...I don't know the ebst term, but maybe "graininess" covers it, from other desctiptions I have heard. There was just a bit of sweetness in there that was surprisingly well balanced by the bitterness from the cluster hops, which provided a strong counter that had its own character. The finish as I remember it was clean and refreshing, leaving me wanting more. The bottle didn't last too long! Those are the main things that I remember about it: fresh, refreshing, drinkable and addictive. I can see how this became so popular in Louisville! My father also enjoyed it very much, as did my #2 son, Mike, so I figure that I've done well with this. I enjoyed another one of these last Friday evening, 24 November 2017. Just like before, it was wonderful and exactly as advertised: tasty, drinkable and addicting. I finished the glass wanting more, and I am really loving this colour, as well. I really can't think of any changes that I would make to this, although some folks might want to bring the IBUs up just a bit. Right now, I have them at just a hair over 24, but I could see that some might prefer them to be a little closer to 30...maybe around 28. I personally wouldn't go over 30, as I feel that would defeat one of the goals of this style, which is to lean a bit malt-forward. This is a very special beer and I imagine that it will show up on my rotation often. If anyone is looking to give this a try, I don't think you would be disappointed!